YOU CAN HELP PROVIDE CLEAN WATER WITH A NEW WELL. The Stirbu family was very happy to have their new well finished. 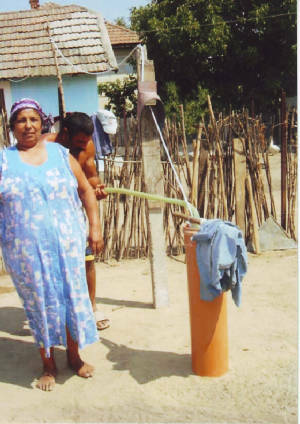 In the villages, the families all have to use the village well. The water in the village well is not clean and the people get sick from the parasites. 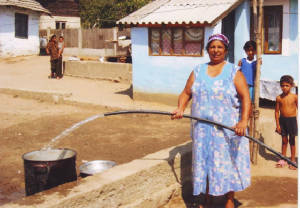 In the picture above, our founder, Patricia, is enjoying a drink from the new well. The wells we provide are made from fiberglass. As you can see they are getting good pressure with the water. The cost is approximately $1,000 each. If you would like to bless a family with a new well, please contact us.